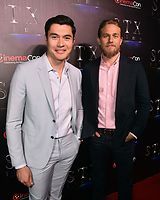 On April 2nd, Charlie attended The State of the Industry Past, Present and Future and STXfilms Presentation the during the 2019 CinemaCon in Las Vegas, Nevada.During the presentation Charlie and Henry Golding discussed the upcoming Guy Ritchie film ‘The Gentleman’ which they both have roles in. 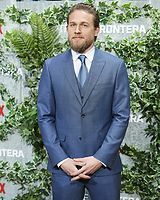 Charlie Hunnam talks ‘Triple Frontier’ and how he stays grounded in Hollywood. 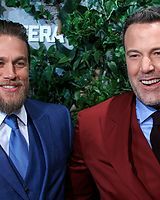 AMNY.com — In J.C. Chandor’s “Triple Frontier,” Santiago “Pope” Garcia (Oscar Isaac) calls upon the best of retired Special Forces Ops to pull off a risky heist in an unspecified multi-border zone in South America. The men — played by Ben Affleck, Charlie Hunnam, Garrett Hedlund, and Pedro Pascal — leave their tattered lives behind for a dangerous mission — the takedown of a drug cartel boss. Their “reward” is walking away with his loot, but they soon discover it all comes at a price. 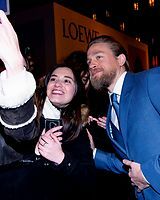 We recently caught up with Hunnam, who plays William “Ironhead” Miller in the movie. 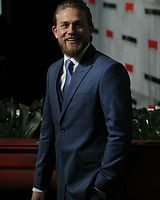 The 38-year-old Brit, best known for his role as Jax in FX series “Sons of Anarchy,” talks about how he prepared for the heist film and how he stays grounded in Hollywood. The film tackles the psychological impact of a career in the military. Is that something you researched before filming? It was my intuition before I even read the script. That’s what interested me about this world. It’s the two fundamental aspects very specifically attributed to the experience of being a soldier that is not very well talked about. I mean PTSD is a hot topic but there’s an umbrella of PTSD, which is really just about purpose. What do you do when you have dedicated your life to a certain skill set and through that belonging to a really deep sense of community … What do you do when all of that basically gets taken away from you? When you come back and you don’t have a deep sense of community anymore? The primary skill set that makes you feel vital is no longer deemed valuable and yet you’re still in the prime of your life. It seems to me like a really, really difficult dual aspect of reintegration that has to be dealt with. This is also very a physical film. There’s a lot of traveling and hiking with all of that bulk through strenuous conditions. How much of that did you really have to endure? It’s become this sort of fashionable and very common narrative that seems to have developed in the filmmaking community where they like to talk about how difficult it is to make these movies. Maybe it’s sort of an unapologetic aim to make themselves sound heroic. My perspective is that the physical challenges of making films are never that difficult. Where the real challenges lie is getting the work right. It’s the creative challenges, the emotional, intellectual, spiritual challenge of trying to [do] a very important subject matter of justice. At the same time, there also has to be a little physical prep for filming those certain sequences. Do you adhere to a physical regimen before shooting? It’s a necessity for me to stay in shape. It’s one of the elements of my day to day therapy. I like to stay fit and eat healthy. For this, I had just done a project that I’ve lost a lot of weight for and J.C. wanted me to be as formidable as I could be. So, I just got back to the routine of eating very, very heavily and protein-rich and lifting heavy weights. Garrett was taking the physical elements of this job very, very seriously too. And he’s been a lifelong buddy of mine. So, I got to go train with him a lot and, keep him company in the gym. What keeps you grounded despite the success you’ve had in your career? I think probably the terror that it might run out at any point and then I would be confronted with the issue that we deal with in this film, which is how would I continue to feel valuable in my life? I feel like the vast majority of people who work in this business live in constant terror that may be their run of good luck or ability to keep making a living at this will potentially run out at some point. In terms of staying grounded, just be a normal person. I think where I’ve seen a trend of people becoming affected by success is that they got into this for extrinsic reasons rather than intrinsic reasons. People who got into this wanting fame and wealth as opposed to people that felt that storytelling would be a really judicious use of their time. 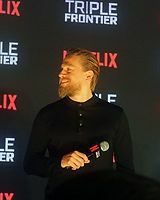 On March 8th, Charlie joined Triple Frontier his costars Ben Affleck, Garrett Hedlund, and Oscar Issac in Singapore for the exclusive Fan Event held for the film followed by a Press Conference which was held on March 9th. You can view photos from the event in the gallery now. 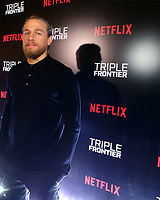 On March 6th, Charlie joined Triple Frontier his costars Ben Affleck, Garrett Hedlund, and Oscar Issac in Madrid, Spain for the premiere of their film. You can view photos from the event in the gallery now. 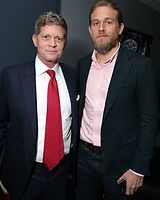 HollywoodReporter.com — Charlie Hunnam thought he was preparing for his upcoming role in Triple Frontier on a private beach in Hawaii where he was enjoying a little wrestling match with longtime friend Garrett Hedlund. Instead, their horseplay was captured by the paparazzi and helped to reveal to the world that the long-gestating Triple Frontier was finally happening after years of directors and A-list talent coming and going. The entire cast was taking swimming lessons for insurance purposes, even though they knew how to swim. Triple Frontier is the story of five special forces operatives who reunite in order to eliminate and heist a South American drug lord. What could go wrong? The film began its long road to the big screen in 2010 when director Kathryn Bigelow and screenwriter Mark Boal attached themselves to the project along with Tom Hanks and Johnny Depp. The film stalled until writer-director J.C. Chandor joined the mix in 2015. From there, the cast was a revolving door of names including Will Smith, Channing Tatum, Tom Hardy, Mahershala Ali, Casey Affleck and Mark Wahlberg. 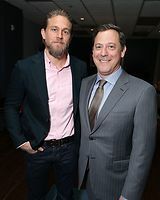 In May 2017, Netflix acquired the project from Paramount, and Chandor assembled a cast that included Ben Affleck, Hunnam, Hedland, and Pedro Pascal, but soon the project would sustain some more misfortune. Just before production in 2017, Affleck had to leave to attend to his personal health. However, Chandor was so committed to Affleck that he delayed the film another six months so his star could return; this delay also opened the door for Chandor’s A Most Violent Year lead, Oscar Isaac, to enlist as the final piece to the puzzle. 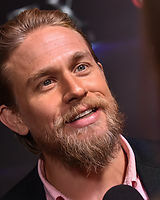 Hunnam is no stranger to stops and starts in Hollywood. In 2013, he famously exited the role of Christian Grey in Fifty Shades of Grey, a part that would have been his most high-profile role to date. 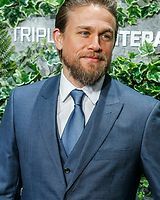 Hunnam recently made amends to Fifty Shades director Sam Taylor-Johnson by way of her indie film A Million Little Pieces. 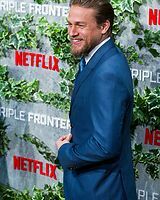 Triple Frontier is also Hunnam’s first release since Papillon was met with mixed reviews and minimal box office returns in 2018. 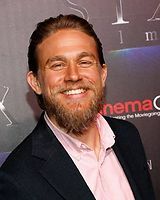 In a recent conversation with THR, Hunnam also discusses his filmmaking aspirations, the influence of his former directors and his friendship with Sons of Anarchy co-star Ryan Hurst. I’ve followed Triple Frontier’s developmental saga for many years. I finally learned it was nearing production thanks to a photograph of you tackling Garrett Hedlund on a Hawaiian beach. Can you provide some context to this team-building exercise of sorts? [Laughs] Yeah, that was unfortunate. I know exactly what you’re talking about. I have been very, very dear friends with Garrett for about 15 years. In this film, he plays an MMA fighter, and I am a Jiu-Jitsu practitioner. So, I was teaching him some Jiu-Jitsu and we were rolling a lot and fighting a lot. We just happened to be on the beach one day doing some swimming lessons, which were grossly unnecessary seeing as we’re not five years old, but I guess for some sort of insurance thing we had to do some swimming lessons. The sun was shining and we were in good spirits, so I just tackled him and had a little wrestle. But, it was not intended to be photographed and documented for the world to see. This film is about brotherhood, something you’re familiar with thanks to Sons of Anarchy, both on and offscreen. Did part of you accept this project as a way to recapture an atmosphere that you clearly flourish under? That’s a really interesting question and multifaceted for me. I think that I do flourish in the company of men. I’ve come to realize that the sense of tribe or community that I have with my group of friends is one of the pillars of my life. For me to be at my best, I need a group of pals around me — my sort of extended family. In sort of exploring that, I think what J.C. Chandor was exploring in this film are two of the three pillars of self-determination theory — competence and autonomy — which can be bracketed under the banner of purpose and community. Sebastian Junger wrote a really interesting book about military life called Tribe, which is a book that I really admire and have read a couple of times (and had read just prior to reading this script). It really resonated that what Sebastian Junger is exploring in Tribe is basically the same thing that J.C. is exploring, which is fundamentally how we categorize or identify some sort of deep meaning for ourselves as individuals. The idea being that purpose and community are two of the central pillars for a successful, fulfilling life. Because you’ve acted in ensembles with many big personalities in the past, were you able to adapt to this ensemble of movie stars with relative ease? AN: This interview has been translated via Google Translate. My apologies on any inconsistencies. 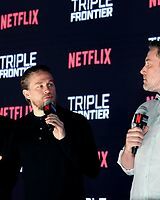 Cineserie.com — It was in Madrid on March 6th that we had the chance to meet almost the whole crew of the film “Triple Frontier” by JC Chandor, which will be released on Netflix on March 13th, 2019. 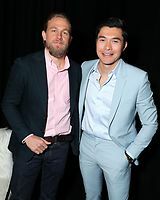 It was in pairs that we were able to see the actors in order to ask them questions about the acting profession, their respective roles in the film … Let’s continue today with Charlie Hunnam and his friend Garrett Hedlund. We continue our interviews with the team of the film Netflix Triple Frontier , directed by JC Chandor . After our interview ( which you can find here ) with Ben Affleck , Oscar Isaac , here is the turn of the duo Charlie Hunnam / Garrett Hedlund , friends in the city and to say that in the film, where they interpret two brothers , it feels . 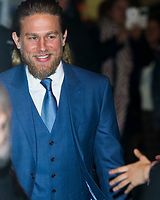 Charlie Hunnam ultra laid back and very smiling comes first, straight out of an episode of Sons of Anarchy ! 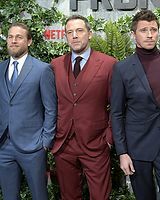 Blonde goatee, hair back, ultra fit, the one who was King Arthur for Guy Ritchie begins to respond with great generosity to our questions (30 min instead of 15! ), All with a British accent! A few minutes later Garrett Hedlund starts, apparently tired of the jetlag. 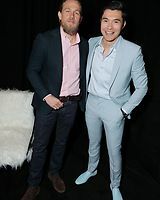 Charlie Hunnam gives him a “Hey Buddy”, it’s clear these two get along very well. Charlie, are you known for being very picky in choosing your roles? Why this one? 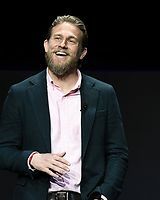 Charlie Hunnam: I think that in an acting career, it’s essential to be picky yes. I have been exposed to the military in the past thanks to the success of Sons of Anarchy. We have often been invited to military bases. These guys have a serious purpose in life. 2 topics really touched me in the film, the loss of the community and deep integration in a group. Live and die for others, your role in the group. Then there is the return to society, isolation … That’s one of the things I wanted to see in JC Chandor’s film. This is not exclusive to the military of course, but the fact that these guys spend the early part of their adult lives cultivating specific non-applicable gifts for something else is fascinating. What do you think of the controversies around Netflix and what Spielberg said about Netflix and the Oscars? Garrett Hedlund : First of all I would like to say that Roma is an incredible movie! In my opinion, Netflix and the other platforms give people who do not have a cinema close to home the chance to see the movies. They also give the chance to people who can not afford the movies. To make the road, to pay for one’s place, to buy food and drink for the meeting, all this is very expensive. On the other hand, I already made a movie Netflix, Mudbound and when he came out on the platform, friends from around the world called me the day or the week of the release, it’s unique. Everyone could see it, wherever they are and comfortably seated in their sofas! 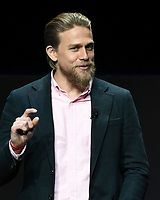 Charlie Hunnam: It’s an inevitable evolution. The reality is that cinema in theaters has declined in the last ten years. It’s extremely expensive to do, and there are fewer opportunities to make movies. Spielberg must recognize that he is one of the only ones still able to make the films he wants the old way. There is no difference between the aspiration and the quality of the work of a film for the cinema and a film like Roma. Could you describe your characters and your relationship in life and on screen? 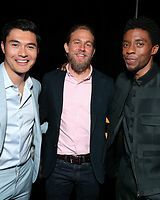 Charlie Hunnam: Garrett and I have known each other for 15 years. All these years traveling the world, going out, and visiting. We have been asked many times if we were brothers, there has always been hope that we will work together. And this opportunity to play brothers is great, plus in a movie about the community. Last year I had an incredible year, I did 4 movies, but the thing is that I was away from home, my girlfriend, my family, 50 weeks of the year! So it’s great to work with his buddy like that, it’s like taking a little home from work, especially when you have 4 months of filming! On screen, I do not really know how we’re doing. Like Garrett I have 3 biological brothers, and I also have 4 non-biological brothers, and one of them is Garrett. One of our missions during filming was to cultivate this relationship. And I hope we have succeeded. What does it bring you to be an actor, does it go further than a simple job? 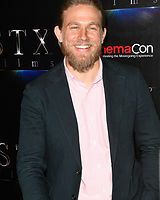 Charlie Hunnam: I have always needed to find a deep meaning in my life. I fell in love with children’s cinema, and suddenly getting to film seemed like a wise choice and it was an interesting way to spend my time. 20 years in the business only supported that. We need a deep purpose, responsibilities, it’s important for mental health and happiness. Are your characters from the movie close to your respective personalities? 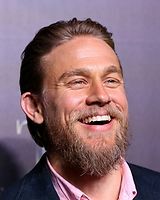 Charlie Hunnam: Part of our job is to combine the need to bring a character back to life while injecting our own essence into it. There are two schools, two approaches to acting: to completely transform oneself, to totally forget oneself in a character (which does not reflect who you are), or to explore and put yourself into the character you play. At the beginning of my career I spent a lot of time trying to reproduce my paternal ideal. It was very personal. And I think that I have come to the end of “this trip”, however I feel obliged to choose films that explore topics that affect me personally and that are important to me. Garrett Hedlund: First you read the script and evaluate how much the character you are supposed to interpret is far from what you are. So you find time to research and see how you can transform. For that one, I tried to personalize it. This fraternity, the support of each other, is basically what Charlie and I feel, and I also tried to bring my humorous touch!